I’ve never been a huge fan of ‘Cinderella,’ but all the studying of fairy tales I’ve done for my dissertation has made me warm up to it a bit. I was willing to give it another chance, and so yesterday I went to see Disney’s new live-action version, directed by Kenneth Branagh. Actually, I’m going to discuss the dress first. In case you missed it, there’s been a massive controversy over the corset and how small Lily James’s waist appears. Just… really? It’s a freaking corset, the whole point of it is to exaggerate the shape of your body! Plus, look at the cut of that gown. When compared with a skirt that puffy, anyone’s waistline would look a bit lost. Both Branagh and James have also denied claims that her body was airbrushed. Whether that’s true or not who knows, but does it really matter? This is nothing to do with body image. Clearly people these days are just clueless about what a corset actually makes you look like. A lot of people also seem to be criticising this film because Cinderella is too much is a passive heroine, especially when compared with Disney’s recent feisty females in films such as Brave and Frozen. I think this a very unfair and naive perspective to take, and one which misses the whole point of the film. Cinderella is not, and never has been, an active character. But that doesn’t mean she’s weak, either. Her story is about endurance, about remaining strong and hopeful through bad times. Branagh’s Cinderella certainly does that, and never once does she complain about her life. She just gets on with it in the best way that she can. Her lack of complaint isn’t a weakness — if anything, it just displays how solid her willpower is. A lot of people could do with taking a leaf out of her book. Too many of us like to moan about inconsequential things, when there is always someone who is worse off. Lily James even makes collecting water look glamorous! Cinderella may not have the most amazing tasks to do, but she just gets on with them. That’s life. We can’t always do what we want. Image from Huffington Post. Kristin over at Tales of Faerie wrote this fabulous post a few months ago exploring what is expected of Cinderella. She points out that realistically, if Cinderella had been defiant then she would probably have received a beating. Which, if you think about it, is true. ‘Cinderella’ is an old fairy tale. To put it into context, think of the thousands of servant girls throughout history who were just like her. They had no way out of their situations, no chance to be the active, feisty heroine. Sometimes real life just doesn’t work that way. In this respect, Cinderella’s perseverance is quite remarkable. Many would have despaired much sooner. As Kristin says, ‘her courage makes her a good role model.’ Just a different sort of role model. Those who criticise her for being passive are not paying attention to this. It’s all in the mantra repeated throughout the film: ‘Have courage, and be kind.’ It will pay off in the end. 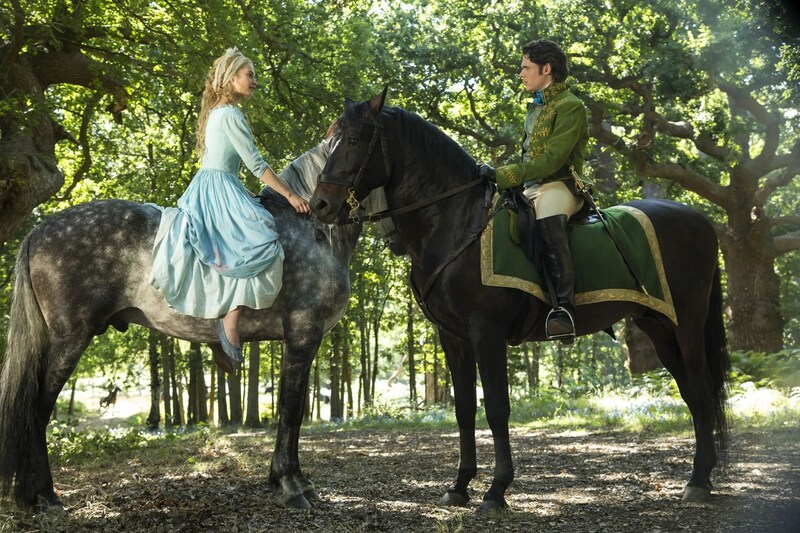 Cinderella and Prince Kit meet in the forest, where else? After all, this is a fairy tale! Image from Collider. One thing I will say, though. Whilst I don’t believe she’s weak, Branagh’s Cinderella is sickeningly good. I know this is a stereotypical trait of fairy tale heroines, but he’s taken it to the extreme. Cinderella spends her days feeding and playing with animals. She reads to her father, and hums or sings all the time. Her hobbies include sewing and gardening. None of this is bad, but it just gives her character too much of a perfect image. It wouldn’t hurt to give her a few flaws, or a few grittier skills to make her more interesting. Of course, her sickening-goodness means that when she meets the prince (who is called ‘Kit,’ and considering I’ve recently watched the asylum season of American Horror Story I’m sure those familiar with it can imagine what my mind conjured upon hearing that name!) she is suitably awkward. And so is he, for that matter. It works, because it fits their characters, although after awhile it feels a little too twee. However, I do like that they meet in the forest before the ball and spend a lot of time alone together on the night itself to get to know one another. This somewhat banishes the insta-love vibe of Disney’s original 1950’s film. Story-wise, Branagh’s adaptation stays very true. Thankfully, the stepmother isn’t given too much backstory. Just enough to make her sufficiently malicious. Any more would have been straying into Maleficent territory, and the less said about that the better. The whole giving-villains-backstory-thing is getting a little wearing. When the stepmother and stepsisters leave for the ball, Cinderella cries in the garden and calls to her mother. I thought this was a nice touch, as it harks back to the Grimm Brothers ‘Ashputtel.’ In this story, instead of a fairy godmother appearing the girl cries on her mother’s grave and leaves offerings, and is helped by her mother’s spirit in the form of a bird. The spirit of Ashputtel’s mother helps her to go to the ball. Artwork by Elenore Abbott. Image from SurLaLune. Speaking of the fairy godmother, she also narrates the story throughout the film. Personally, I thought this worked really well. It made it feel like a fairy tale; like it was being told instead of us just seeing it happen. The final thing I have to say about this film is that the imagery is stunning. The sets and costumes are so realistic, it’s like watching a period drama. Compared to Maleficent, Disney’s other live-action offering so far, Cinderella is far superior in terms of visuals. Maleficent looked very CGI and fake, but there’s none of that here. The fairy godmother’s magic looks natural — not overdone, just pretty. I hope that their future live-action remakes follow suit. The ballroom scene looks very grand yet authentic. Image from Bails of Hemp.